Performance Auto & Sound Magazine (PASMAG) is focused on delivering a higher standard in the automotive enthusiast publishing sector. They are committed to delivering market-leading value, innovative promotional campaigns and high-impact content to both readers and advertisers alike. In addition to publishing 11 issues per year, PASMAG produces over 12 event guides for high-traffic industry shows and automotive events. PASMAG merges the two worlds of mobile electronics and high performance to create the total enthusiast package. American Drycleaner is a magazine serving drycleaning plants. Having serviced the industry for more than 75 years, it is a respected authority on everything necessary to operate a drycleaning business. American Drycleaner covers the latest news, trends, and events affecting the industry and furnishes details on the latest equipment and supplies. B Magazine Beauty & Beyond is targeted to women ages 30 to 55+ and builds on the premise of individual beauty and a balanced lifestyle. B's main editorial mission is to inform and entertain while inspiring readers to improve both their inner and outer beauty and add to their esteem. Ooorale USA is a free, weekly, Spanish-language, variety magazine distributed in Los Angeles and Orange counties and written for the Spanish-speaking Hispanic communities of Southern California. The magazine features sports scores and stories, community events, reader submissions, health stories, foreign event coverage, and self-help articles. In addition to the magazine, Oorale USA also sponsors community events. Every year, the magazine holds three major events: 5 de Mayo, Grito de Independencia, and La Feria de los Moles. Verified has recently partnered with Tribune Interactive, a subsidiary of Tribune Co., to validate and certify the results of a series of cross-media contests they have developed. Tribune Interactive manages the interactive operations of Tribune's daily newspapers and their associated websites, plus all aspects of the company's advertising operations. During the first contest, "Beautiful Babies," photos were posted in an online gallery for public, online voting. Voting was open to registered users, with only one vote per user allowed. The top 100 babies were chosen by voters and then a panel of judges chose the winner. Tribune Interactive was able to validate over 33 million votes in their first contest. Server logs, provided to Verified at the conclusion of the voting, covered the entire voting period. Verified was contracted to confirm the results of the vote by Tribune Interactive, using methods to count and analyze the logs of the online voting activity. After confirming the results of the contest, Verified provided Tribune Interactive with a report of its findings. This report allowed Tribune Interactive to demonstrate that the results of the contest are beyond reproach and were verified by an independent third party. Verified worked with Tribune Interactive on "Glorious Gardens" and is currently working with them on "Furry Frights"—the best dressed pets for Halloween—with plans to continue with future contests. JAGTAG is a consumer-initiated, mobile marketing platform that enables publishers to transform their printed media properties into on-demand and measurable digital media. Using the proprietary 2D printed barcode and a camera phone, consumers are able to request and instantly receive on-demand digital content directly from a brand's print ads, out-of-home, point-of-sale, direct mail, sales collateral, packaging, products and physical structures. JAGTAG does not require the consumer to download an application prior to use. Content can be returned to smart phones and standard phones via a short code, an email, or a WAP link. Returned content is optimized for every handset on the market, based upon the requesting phone's technology requirements, media player, and screen size. Readers can request editorial content, advertiser content, product information and demos, category information, helpful tips, promotions, coupons, sweepstakes, and more. Consumers can sign up to receive ongoing communications sent to their phones from either a publisher or their advertisers. For example, earlier this year, Qdoba, a Mexican fast-food chain, ran a mobile coupon campaign using the JAGTAG barcode system to promote a new restaurant near the University of Michigan campus. Barcodes were placed in ads in the campus newspaper and on posters, each containing a JAGTAG image. People who took a picture of the barcode and texted it to the short code provided received a "Buy One Burrito, Get One Free" coupon via MMS. 400 consumers requested the coupon in six days, representing 1% of all students on campus. Of those who received a coupon, more than half redeemed their coupon in-store over the same six-day period. Through this interaction, JAGTAG also provides advertisers superior metrics and analytics to measure the effectiveness of their physical media. Marketers can measure consumer behavior, as well as source media effectiveness by media channel, media type, media placement, and location. JAGTAG has activated marketing programs for Nike, Red Bull, 20th Century Fox, and Sports Illustrated. For more information about JAGTAG, contact clients@jagtag.com. Verified conducts readership research. 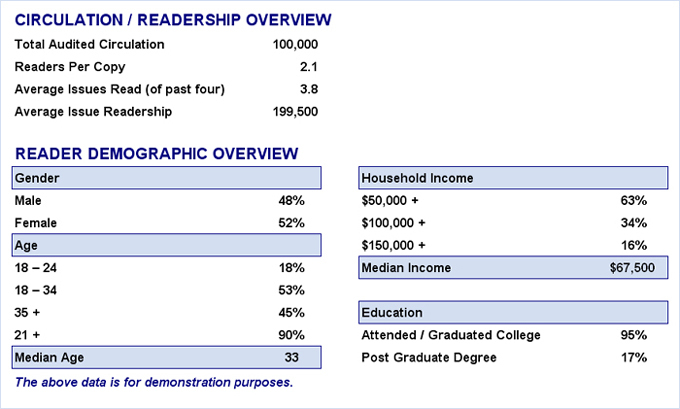 If you need readership information and demographics to include in your media kit or sales presentations, please contact us. Readership research can gather editorial feedback, reader demographics, average issue readership, unduplicated readership for print and online, online usage, reader lifestyle and purchasing behavior, or anything else you may need or imagine. Surveys can also be used to determine if your readership meets the Distilled Spirits Council's (DiSCUS) age demographic criteria. We have out-of-the-box surveys, or we can design a survey to fit your particular needs and budget. We conduct surveys in-publication, online, by phone, and by mail. For more information, please contact Mike Lynch (ext. 214) or Ryan Kawashima (ext. 205) at 415-461-6006. Online media may be generating all the buzz on Madison Avenue these days, but the traditional medium of consumer magazines are both more effective and more cost efficient in influencing key aspects of consumer behavior, according to a first-of-its-kind analysis being released today by the Magazine Publishers of America. The research, which comes from an analysis conducted by advertising effectiveness researcher Dynamic Logic, ironically takes a page out of online media's playbook, effectively leveraging a concept utilized by the Interactive Advertising Bureau's so-called XMOS (Cross-Media Optimization Studies) that so effectively helped that medium get on base with some big marketers and agencies earlier this decade. "Overall, magazine advertising drove consumer attitudes and intended behavior more effectively and efficiently than viewing television advertising alone, or, TV in combination with online advertising," reads the new MPA white paper, which is drawn from Dynamic Logic's analysis of how magazines, online, and TV media influenced consumer behavior across 39 cross-media case studies. The studies specifically looked at how each medium influences consumer behavior—either in combined mixes or incrementally—as they go through five identified stages of the buying process, which is frequently referred to by marketers as the "purchase funnel." For the first time, Dynamic Logic went beyond analyzing advertising effects for these three media and looked at the cost of generating results for each medium individually as well as in combination with others," the MPA white paper says, noting that the end result can be looked at as the ROI, or return-on-investment, each of the three media contribute to a marketer's bottom line. The paper asserts that magazines were found to be the most "cost effective" medium throughout the purchase funnel, when analyzed on the basis of the actual cost per person and the number of people impacted for each advertising dollar spent via each medium. Looking at each of the five criteria individually, magazines were proven most cost effective in delivering three forms of ROI: aided brand awareness, overall brand awareness, and purchase consideration / intent. Magazines ranked second behind a mix combining magazines and online media for a fourth criterion, brand favorability. Magazines, as a stand-alone medium, performed less effectively for the fifth criterion—message association—but were a significant contributor to its effectiveness when combined with online media. A copy of the white paper can be found on the MPA website. 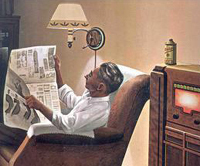 According to a new consumer trend report from TargetCast tcm, among American adults between the ages of 18–64, the future of traditional media, particularly newspapers, magazines, and radio, is challenged by the rapid migration of hard-to-reach consumer groups to digital alternatives. However, when it comes to purchase influence on consumers, traditional media remains more influential when compared to digital advertising. The study reveals a divide between men and women in how each gender engages with traditional media and illustrates how a generational divide is affecting purchase influence among adults. Peter Sedlarcik, SVP, Director of Insights and Analytics at TargetCast tcm, says "... marketers must take into account the evolving media preferences of specific target audiences... yet, while many may declare print media is dead... findings show that marketing messages in newspapers and magazines still score well in terms of consumer attentiveness and purchase influence." 60% of consumers say newspapers need to change the most to stay relevant, compared to 30% for magazines and nearly 20% for radio. Fewer than 10% feel that TV or the Internet needs to change to stay relevant. Nevertheless, those ages 35+ still consider newspaper ads to be more influential in determining their purchase decisions. The majority of adults 18–64 report that they are still using the same amount of each medium today as they were a year ago; however, nearly a third say they are using less printed media (newspapers and magazines). Conversely, a third or more also report that they are using the Internet more as both a source of information and entertainment. The data reveals a split between men and women in terms of the way each gender engages with traditional media and embraces newer media. In general, men are more willing to adapt their usage habits to incorporate more digital and online platforms as replacements for traditional media. On the other hand, women are more likely to hold strong with the traditional media and are more hesitant to embrace newer media. 40% of adults aged 18–64 say that they prefer the experience of reading printed newspapers over online news sources. Additionally, newspapers score well both in terms of ad attentiveness and purchase influence. However, when asked if they'd rather get news from online sources than from printed newspapers, the percentage of those who agreed vs. disagreed was about the same. And, people do not feel that newspapers are more trustworthy than online sources. 72% of consumers expect that sourcing the newspaper online should be free and are not willing to pay for an online newspaper subscription to replace their printed newspapers subscription. 57% say they prefer the experience of reading a printed magazine over reading a magazine on the Internet. An even stronger 71% would not be willing to pay for an online magazine subscription to replace their printed magazine subscription. Also, only 15% of respondents overall agree that they'd rather read magazines online. Additionally, printed magazines score well in terms of ad attentiveness and purchase influence. 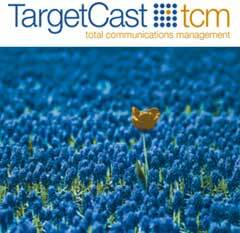 41% of those surveyed indicate that radio is still relevant in today's media environment. According to respondents, radio provides a great venue to discover new music that cannot be experienced elsewhere. And, respondents overall prefer to listen to music through the radio station vs. Internet stations or on their mp3 player.